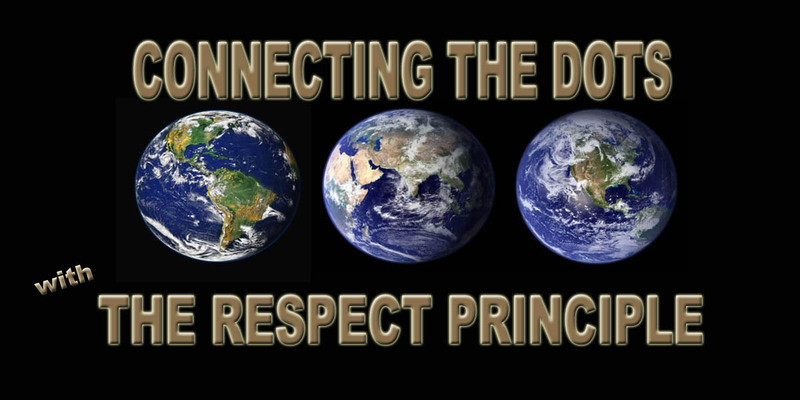 What we need the most to sustain, not only the earth, but those it supports, us, is a high enough “Respect Level” so we quit destroying what supports our life and the generations hoping to also continue living, not just on earth, but on a viable, healthy earth. Every action and inaction reveals our “Respect Level” and invites us to do better … to develop the best practices we can … individually and collectively. Check out the following I copied and shared from my daily email from Joel Osteen because of his words about the Biblical need for “respect” and the benefits we reap … as husbands, wives, and in general. Did you know that the way you treat people has an impact on the effectiveness of your prayers? The Bible says that the prayer of the righteous person is powerful. But if we aren’t treating others with honor, kindness and respect, then we aren’t allowing His righteousness to operate in us. When we don’t treat others the way we should, it closes the door to God’s power and hinders our prayers. This is especially true in a marriage relationship. Marriage isn’t just an agreement between two people to live life together. Marriage is a God-ordained institution that helps us understand love and unity. When two people are married, they become one physically, spiritually and emotionally. This particular passage is directed toward husbands, but it applies to all believers as well. We should all treat others “with understanding,” which means considering the needs of others above our own. We should always aim to treat others with kindness, dignity, and respect and quickly choose forgiveness. The Bible says that the way we treat others is the way we treat God. So choose love and treat others with respect so that your prayers will not be hindered! Father, teach me to live in Your ways. Help me to always treat others with love and respect, which shows that I honor You. Show me how to be a blessing to others so that my prayers will be effective in Jesus’ name. Amen. Over 7 billion people live on the earth … and each one is a unique blend of gifts, talents, and abilities that are shaped by their experiences and that turn into the beliefs … conscious ones or subconscious ones. Assumptions are our thoughts about something or someone … they are something taken for granted … something assumed, but not proven. (Oxford Paperback Dictionary). Even with the definition alone, is to easy to comprehend how assumptions can get us and our relationships into a lot of trouble through misunderstanding and our perspectives. Narrowing down the 7 million to 16 personality types, such as the Myers Briggs Type Indicator (MBTI) that is based on Carl Jung’s work, plus their experiences and beliefs is still a major challenge to contend with in trying to have respectful, peaceful, and supportive relationships. To further narrow down perspective, Paul and Barbara-Barron Tieger’s research revealed that the majority of the US population is dominated by the “E”xtrovert personality type that thrives on a high level of interaction with others like themselves. The other smaller portion of the population is an “I”ntroverted type whose brain requires regular quiet and solitude to manage their high internally-stimulated brains. As you can deduce, all these, and many other complications can make for very difficult relationships when we take for granted that people experience the world in the same way we do, that people think about the world in the same way we do, and react in the same way … assuming without proving their assumptions. For example, in my family, as with many other families, I am the one more different than the majority. Depending on who you talk to in a family, some are called “black sheep” with the connotation that the others are white and therefore good, some are called odd ducks, weird, crazy … and well, you get the picture. It doesn’t matter what personality type the majority are, what matters to “the pack” is that the one outside “the pack” is seen as different … and differences, in packs with low “Respect Levels” … be they families or any collection of people brought together in some way … are not only seen as different, they are deemed problematic … even dangerous. Teasing, tormenting, shunning, ostracizing, and casting out the different one is usually the first step, though sometimes physical harm is also used as a way to vent fear and to try and control the one being cast to the outside. I was a bold little child, albeit quite often alone or leading when with others. An avid learner, I was an “A” student from the getgo until the factory education model of everybody learning and being the same created havoc for me. School became less and less fun, dominated not by learning, but by the ridicule experienced for being bored in class and by not being in the major packs in the school yards. Even teachers back then did not know what to do and resorted to punitive psychological, as well as physical punishments. With the lack of understanding by the masses of personality types and low “Respect Levels” for those more different from the majority, the teasing, tormenting, shunning, ostracizing, and casting out continue and for some with more drastic consequences … such as the loss of their life … by their own or a “pack’s” hands. Extroverts are quick to point their fingers at “loners” as threats, but the ignorance and lack of acceptance of differences between Extroverts and Introverts fuels the erroneous assumption that all loners … Introverts … are dangerous … demonstrating the truth they are taking something … someone for granted … without proof … that’s what beliefs on ignorance and untruths do. The interesting contrary thing is that though there are some loners, often broken by the societal rejection, who then set out to harm others … more loners … Introverts … especially broken ones … often become easy targets and prey for both Introverts … and Extroverts. To stay safe, Introverts will even transform themselves enough to be accepted into the pack, but unfortunately, with this transformation, they often give up too much of their true selves and a price will have to be paid by them at some point … for me, it was a fierce internal boil of anger at others for not being acceptable, for forcing me to be what they wanted by their mind games, and my own anger at myself for giving in and giving up on myself … all of which I mostly displayed with sarcasm, a cutting tongue and wit … a constant stream of intense negative energy and the need to be better … perfect even … all of which was so far removed from the tender-hearted compassionate soul broken by so much cruelty at a young age. Extroverts dominate our world, creating a lot of noise and busyness for them to thrive … and Introverts are often just trying to live in the peace and quiet they need to thrive … and sometimes, both even meet in the middle … and we can do so more successfully to create a better world … if we stop assuming one is better than the other … one is more right … one is more … whatever. Extroverted activity makes things happen, but it is Introverted creation that give the Extroverts much of what they need to keep the world moving forward. When we learn and accept this knowledge instead of making assumptions based on our own limited experiences and knowledge, much of the pain, frustration, bitterness, resentment, fear, prejudice, ostracization, and violence will diminish … and we will move into a new realm of co-existence not yet experienced in humanity. And maybe one day, my siblings will see me differently, as I am learning to see them differently too … and all siblings and only children will too … and forgiveness, acceptance, peace, and respect will strengthen our relationships with each other … as it is strengthening the relationship with myself, healing the scars from years of cruel rejection and the backlash it created in me and my actions … and in so many of us. Till then, the realized benefit is how learning this is transforming me … softening my edges … replacing my pain and anger with respect and even love … the unconditional kind. Awesome stuff is “Connecting the Dots … with The RESPECT PRINCIPLE” because even if you don’t need to learn it, I certainly did … because the benefits are of the positive, life-altering kind. And then when you add God’s unconditional love that I have been studying particularly this past year … anything is indeed possible! Thanks for dropping by one of 7 billion! When there is no respect … indifference grows. When there is no love … hate grows. … and we all pay the price with the quality of our lives.